Krystyna K. Matusiak is Associate Professor in the Library & Information Science Program (LIS) at the Morgridge College of Education. 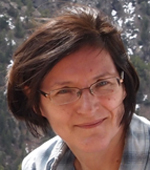 Krystyna’s research and teaching interests focus on the digitization of cultural heritage materials, digital libraries, information behavior, user studies, visual information, and data curation. She is committed to user-centered principles in information design and is passionate about educating the new generation of information professionals. Krystyna earned her PhD from the University of Wisconsin-Milwaukee in the Interdisciplinary Program in Digital Information Design and Organization. Her dissertation is entitled: The Use of Digital Resources in an Academic Environment: A Qualitative Study of Students' Perceptions, Experiences, and Digital Literacy Skills. She received the 2009 Association of College and Research Libraries (ACRL) Doctoral Dissertation Fellowship. Krystyna also served as a digitization consultant for projects funded by the Endangered Archive Programme at the British Library and assisted digital library projects at the Press Institute of Mongolia in Ulan Baatar, Mongolia and the Al-Aqsa Mosque Library in East Jerusalem. Presenting a poster at the International Federation of Library Associations (IFLA) World Library and Information Congress, Kuala Lumpur, Malaysia, August 26-27, 2018. The poster, Immigrant information seeking behavior in everyday life: Photovoice study was based on the study conducted with Dr. Assefa and two LIS students, Emily Bongiovanni and Angela Naumov.